Lapu-Lapu City will commemorate the 492nd anniversary of the Battle of Mactan, known locally as “Kadaugan sa Mactan,” this April 27, Saturday. The day is a special non-working holiday throughout the city by virtue of Proclamation 563, which Executive Secretary Paquito Ochoa signed in the name of President Benigno Aquino III. Read the full text of Proclamation 563 here. In making the declaration, Aquino noted that the Battle of Mactan is a “significant event in Philippine history (which) serves as testimony to the rich cultural and historical heritage of the Filipinos.” The said battle, which features folk hero Lapu-lapu and famed Portuguese explorer Fernando de Magallanes (Ferdinand Magellan) is credited in history as being the first instance where Filipinos fought foreign rule. 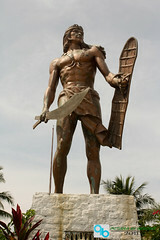 Little is known however about Lapu-lapu’s background, particularly his life after the battle. In line with this celebration, the City Government of Lapu-Lapu will be organizing for the third straight year the “Kadaugan Street Party” from April 27 to 28. The event, to be held in Manuel L. Quezon Highway, will feature “bands and live performances, sporting events, great music, and delicious food,” according to a report by The Freeman.